During the course of your job search, you will likely be required to submit contact information for references to be obtained. References are a way for the company to get third-party feedback on your skill set, work ethic and performance. It is important to note that these references will be contacted either by a Representative of General Placement Service or by the member of the interviewing company. You should typically include 3 or 4 professional references. These would be from current and former Managers, Supervisors or co-workers. Ideally, you will have a a point of contact from each of your last 3 employers. If your search is confidential, contacts from past employers should be sufficient. Depending on your positions, you may want to include clients or agents who regularly conducted business with you. Should I contact my references in advance? Absolutely! Not only should you contact your references but you should notify them of the position you are applying for. They need to be aware that they will be contacted for a discussion of your experience and results. Ask them to be honest and thorough in their answers. A glaring reference can help you stand out from the rest of the candidate pool. How should my references be presented? 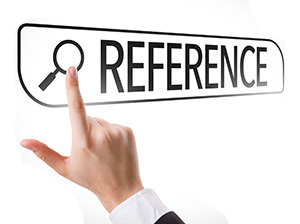 References should be a separate document and not be included with your resume. Although you should use the same format and header that is present on your resume to maintain consistency. It is important to provide accurate contact information for each individual you list. This includes their full name, title, employer, phone number, email address and your relationship with that individual. Jane was my immediate supervisor and performed regular analysis of my management capabilities.